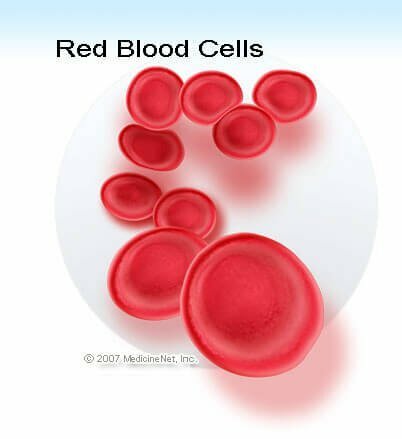 CBC: A commonly used abbreviation in medicine that stands for complete blood count, a set values of the cellular (formed elements) of blood. These measurements are generally determined by specially designed machines that analyze the different components of blood in less than a minute. White blood cell count (WBC). The number of white blood cells in a volume of blood. Normal range varies slightly between laboratories but is generally between 4,300 and 10,800 cells per cubic millimeter (cmm). This can also be referred to as the leukocyte count and can be expressed in international units as 4.3 - 10.8 x 109 cells per liter. Automated white cell differential. A machine generated percentage of the different types of white blood cells, usually split into granulocytes, lymphocytes, monocytes, eosinophils, and basophils. Red cell count (RBC). The number of red blood cells in a volume of blood. Normal range varies slightly between laboratories but is generally between 4.2 - 5.9 million cells/cmm. This can also be referred to as the erythrocyte count and can be expressed in international units as 4.2 - 5.9 x 1012 cells per liter. Hemoglobin (Hb). The amount of hemoglobin in a volume of blood. Hemoglobin is the protein molecule within red blood cells that carries oxygen and gives blood its red color. Normal range for hemoglobin is different between the sexes and is approximately 13 - 18 grams per deciliter for men and 12 - 16 for women (international units 8.1 - 11.2 millimoles/liter for men, 7.4 - 9.9 for women). Hematocrit (Hct). The ratio of the volume of red cells to the volume of whole blood. Normal range for hematocrit is different between the sexes and is approximately 45 - 52% for men and 37 - 48% for women. Mean cell volume (MCV). The average volume of a red cell. This is a calculated value derived from the hematocrit and red cell count. Normal range is 86 - 98 femtoliters. Mean cell hemoglobin (MCH). The average amount of hemoglobin in the average red cell. This is a calculated value derived from the measurement of hemoglobin and the red cell count. Normal range is 27 - 32 picograms. Mean cell hemoglobin concentration (MCHC). The average concentration of hemoglobin in a given volume of red cells. This is a calculated volume derived from the hemoglobin measurement and the hematocrit. Normal range is 32 - 36%. Red cell distribution width (RDW). A measurement of the variability of red cell size. Higher numbers indicate greater variation in size. Normal range is 11 - 15. Platelet count. The number of platelets in a volume blood. Platelets are not complete cells, but actually fragments of cytoplasm from a cell found in the bone marrow called a megakaryocyte. Platelets play a vital role in blood clotting. Normal range varies slightly between laboratories but is in the range of 150,000 - 400,000/ cmm (150 - 400 x 109/liter).